BEHIND TIGERSRiewoldt marks on the lead but his shot from 40 metres out misses to the right. Richmond have made a very good positive start to the match. 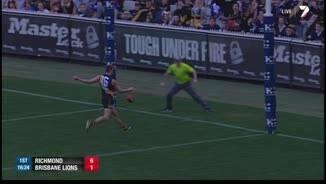 GOAL TIGERSWhite kicks to Riewoldt he marks. He sees McGuane running past and he runs in to the goal square to kick the goal. BEHIND LIONSRaines hurries the shot at goal but it sneaks in for a behind. Tigers InterchangeChris Newman off due to an injury. GOAL TIGERSMcGuane applies the tackle to Rich. The ball comes out from the stoppage with Jackson kicking through traffic for a goal. The substitutes for the respective sides are Shane Tuck and Sam Docherty. It's a sunny Saturday afternoon and we are at the MCG with Richmond hosting the Brisbane Lions. Welcome to MCG for the Richmond v Brisbane Lions Round 20 clash. 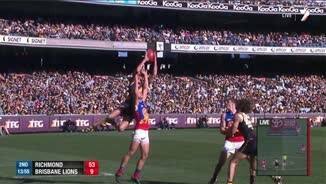 RICHMOND has survived a second-half scare against the Brisbane Lions to lock in its first finals appearance for 12 years. 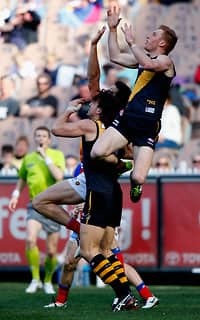 Tigers full-forward Jack Riewoldt kicked his only goal of the game late in the final term to secure the 14.13 (97) to 11.8 (74) win on Saturday at the MCG. While they dropped off badly after half-time, Richmond now has 13 wins and cannot fall from the top eight. 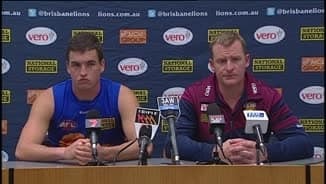 When Pearce Hanley goaled 20 minutes into the last term, the Lions only trailed by 16 points. But Riewoldt's superb goal from an acute angle sealed the Tigers' win. 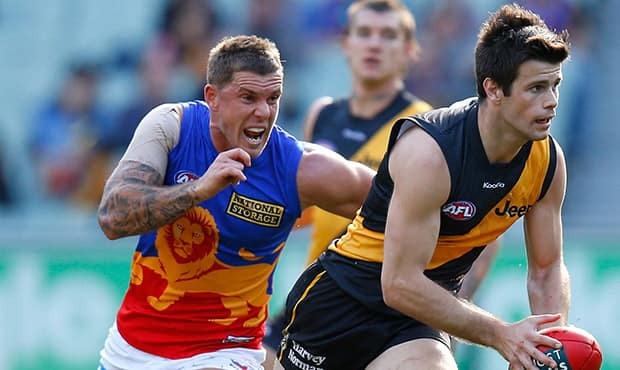 Richmond captain Trent Cotchin was best afield with 30 disposals, while Hanley and Tom Rockliff were prominent in the Brisbane Lions' revival. 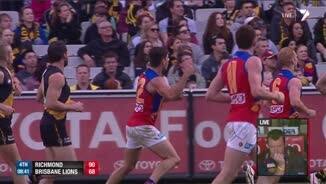 Richmond did not kick a goal in the third term as the Lions steadily worked themselves into the game. 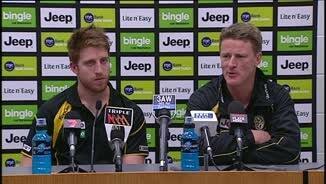 Tigers coach Damian Hardwick was far from impressed with his team's forward-line. "I don't know what our set-shot conversion was today, but I guarantee you it wasn't great, so we'll be doing some work on that this week," he said. The Lions kicked seven goals to three in the second half. 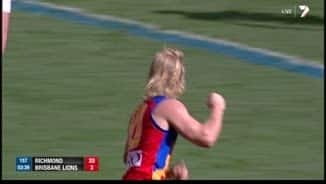 Brent Staker's great kick from an acute angle at 25 minutes was their third for the quarter and they were only 26 points behind at the last change. The Lions had won four of their last five games, but the Tigers overwhelmed them in the first half. The Lions were also without captain Jonathan Brown, whose outstanding career might be over after he suffered a foot injury last weekend. In-form Tigers midfielder Daniel Jackson set the tone of the first half when he snapping the opening goal in the second minute. 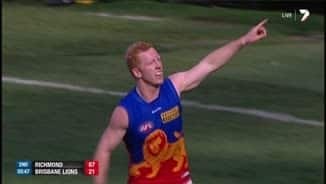 It took the Lions 22 minutes until they kicked their first goal through Daniel Rich and Michael Voss bemoaned the slow start that he felt cost his team the game. "We've certainly looked at all different methods and just how we start the game and we've explored different ways of trying to keep the scoreboard in check, but it gets away from us and that's when you end up chasing, " he said. The Tigers kicked another two, including a booming shot from Luke McGuane after the siren, to be 29 points at quarter time. The Lions fell apart early in the second term, barely touching the ball in the opening eight minutes as Richmond ran amuck. McGuane kicked his third and Shaun Grigg kicked two as Richmond stormed ahead. The highlight of the quarter for the Tigers was a superb running goal from Matt White at 22 minutes. The only statistic where Richmond did not dominate in the second term was the most critical - the score. The Lions did well to restrict the damage, kicking three goals to Richmond's five in the second term for a 45-point deficit. Adding to the Lions' problems, midfielder Brent Moloney was subbed out of the game at the main break with a leg injury.